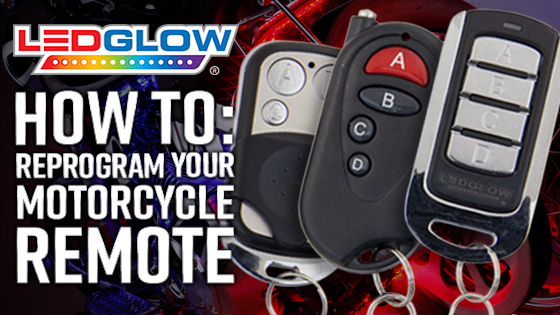 LEDGlow's Replacement Motorcycle LED Lighting Kit 4 Button Wireless Remote will replace your existing 4 button wireless remote. The Version 1 Wireless Remote is discontinued, but the Version 2 Wireless Remote is compatible with all control box types. This remote is great. Works better then the orginal. The keypad buttons and case appear to have a sturdy construction. Programming the fob was extremely easy to do and working in less than 2 minutes. The only down fall is the part didn’t come with any instructions. But customer service emailed me quickly and I was working in no time. My old remote would drain a battery in a week so I ordered this replacement. Programming was super easy. It came with included instructions to show you how to program it. Took longer to get my seat off then to program the new remote. This was the single easiest fix I've ever done. Worked exactly as demonstrated in the video, took me 30 seconds! That includes taking off the seat! Shipped super quick and cost very little. I can't oversell this!